As you could see, it is $ 9 K a year before taxes and expenses. For the Company shares, there is a tax efficient way to re-invest dividends – directly into new shares. By doing this, I am not paying any income taxes on the dividends received. I wish this option is available for the rest of my investments but it is not. At glance it is 3.6% annually, however after paying 10% tax and $400 fee to maintain my account. It will leave me with $ 7.8 K a year or 2.9% a year. This is more or less in line with my estimates for return of 3% but leaves no room to maintain principal. 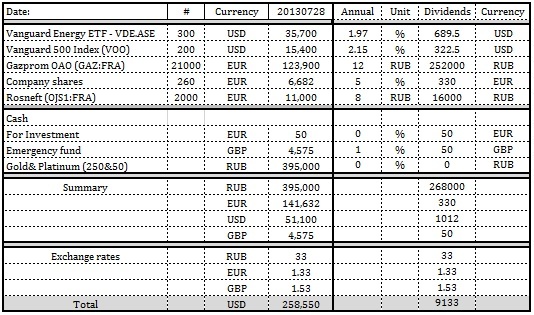 My investments maintain balance between conservative Vanguard ETFs with 2% pre-tax annual return and 4.6% - 3% on emerging markets return (GazProm & Rosneft). What the dividends bring to me now is 12% of my annual needs to cover essential expenses. At the current savings rate, each year brings me $ 1.2 K a year. At the current savings rate – 40 years to go.